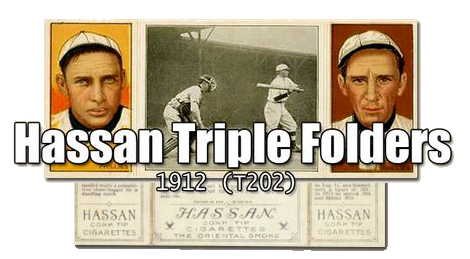 The 1912 T202 Hassan Triple Folders Baseball Card Set consists of 132 cards, which measure 2¼" by 5½", when unfolded. The T202 cards were folded and included in packs of Hassan Cork Tipped Cigarettes. The T202 cards have two color player portraits on each side and a black and white center panel. The portraits of the players was borrowed from the T205 set and the players are usually on the same team. The T202 center use 76 different action scenes, which are described on the back of the card. The major stars included in the T202 Hassan Triple Folders Set are: Ty Cobb, Frank Chance, Chief Bender, Fred Clarke, Eddie Collins, Frank Home Run Baker, Christy Mathewson, Tris Speaker and Walter Johnson. These stars are featured on multiple T202 cards. CLICK HERE if you want to sell your 1912 T202 Hassan Triple Folders Baseball Cards.